This week’s goal was to successfully perform PCR cleanup. Last week we performed gel electrophoresis to determine if there was a positive or negative PCR result. At the end of last week, a majority of the class had negative PCR results, all of which were then retested by our lab advisors. Interestingly, many of the negative results were positive, and this gave the students more samples to clean. The differing results served as a reminder that this class is a work in progress so errors can occur even though we follow the procedure. When we originally performed PCR, we added master mix along with our DNA in order to enhance the specific DNA segment needed for DNA sequencing. This clean-up procedure was meant to remove any “non-DNA” substances from the sample. Cleaning the PCR product removed the Taq polymerase and added primers which will allow for optimal sequencing. The five main steps that were performed during this procedure included: Buffering, binding the DNA to a membrane, washing and drying the product twice, and elution. The procedure includes preparation of sample with NTI buffer, two washing step with NT3 buffer, and follow by an elution step with NE buffer before collection. Each steps helps me further understand the chemistry behind cleaning up of post PCR sample. As every steps was done using buffers that conditions the sample in a way to isolate the desired compound from washing to elution. After the clean-up our samples were Qubit’ed by our lab assistant to quantify how much DNA we had in each of our samples. To learn more about the process of quantification click here. This class has had its ups and downs from successful growth of bacterial colonies on agar plates to having to stay in an hour longer to complete extraction of DNA from bacteria. Overall, some aspects have been fairly easy while some have been quite challenging but still very much rewarding. Like pipetting, the science behind it involves accuracy and precision. 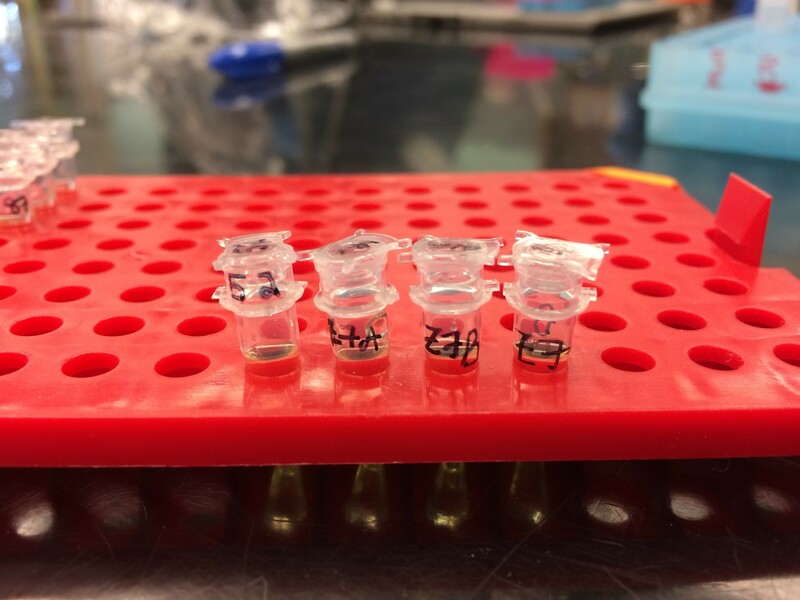 Our samples could have been jeopardized by getting too much or too little of our samples, but a good technique could lead us to a rewarding result as we conduct DNA sequencing. Next week we plan on moving from our normal lab classroom to the computer lab, where we will be conducting the DNA sequencing. 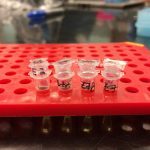 Why is it necessary to dry the PCR product twice? What purpose does it serve in obtaining a pure PCR product? How is the sequencing performed? What programs are used? Are there more effective/accurate methods of sequencing other than Sanger sequencing that we can use?